Author Ron D. Voigts: Where's it's at December 2017? Where's it's at December 2017? The year 2017 is wrapping up, and it has been a busy year. Book 2 in the series, Cavendish Brown Paranormal Mystery, came out. 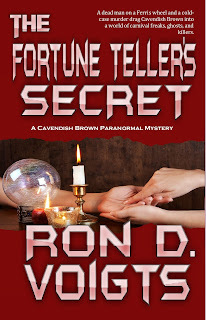 The Fortune Teller's Secret is available at all major retailers. Here are the cover and some quick links. Get at . . . I've been working on website design. Here is a link to the site I have been working on. Not all the links work but you get to see all my books. Check it out here. I've embarked on writing a series on writing mysteries. Ideally, it will cover five volumes. The first to be released early next year. Here are the planned volumes. Writer of 8 mysteries and the Writing the Killer Mystery series. Self-published writer and author at Champagne Books. Copyright 2011 Ron D. Voigts. Picture Window theme. Powered by Blogger.